In September 1957 nine black children tried to integrate Arkansas’s Little Rock Central High School in accordance with the Supreme Court’s decision in Brown v. Board of Education. Claiming he was acting to keep the peace, Gov. Orval Faubus used the Arkansas National Guard to keep them out of the school. After a lengthy standoff, President Eisenhower called in the 101st Airborne and reluctantly, slowly, but forcibly began to integrate the school. The standoff became a rallying cry for Southern segregationists and a marker of the country’s shame. The accounts that have been so mythologized over the years leave people embarrassed and angry, yet the myth is a cardboard cutout of the full story. Turn Away Thy Son, told from the point of view of sixteen key participants, brings the nine students, their tormentors, the school administration, the governor, and the press to vivid life. It shows the truth about Little Rock, beyond the caricatures to the fundamental driving forces that made school desegregation the hottest of hot-button issues in the Jim Crow South. Turn Away Thy Son was originally published by Free Press in 2007. 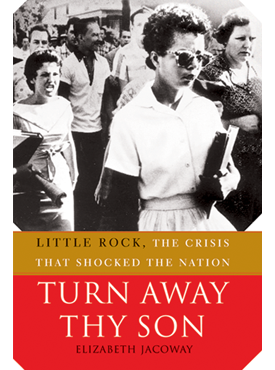 Elizabeth Jacoway grew up in Little Rock, two years behind the class of the Little Rock Nine. After earning her PhD at the University of North Carolina, she returned to Arkansas and has studied southern history and the desegregation crisis ever since. Her previous publications include Understanding the Little Rock Crisis and Southern Businessmen and Desegregation. Winner of the 2008 Booker Worthen Literary Prize.